Radiation is a form of energy that has both beneficial and harmful effects on humans. When used properly in controlled settings, radiation can effectively treat lung cancer, and this effect can be intensified with chemotherapy given at the same time. Radiation therapy is the medical use of radiation to treat cancer and some non-cancerous benign tumors. Radiation for cancer works by damaging the DNA of cancer cells. Cancer cells are much more sensitive to the lethal effects of radiation than normal cells because cancer cells have difficulty repairing DNA damage. In addition, cancer cells are more sensitive to the effects of radiation and DNA damage because they divide much more rapidly than normal cells. Lung cancers are categorized into two groups: small cell lung cancer and non-small cell lung cancer. Radiation may be used for small cell lung cancers, as discussed in the section about small cell lung cancer. This chapter will focus on the use of radiation therapy for non-small cell lung cancer. See Chapter 5: Treatment of Small Cell Lung Cancer. The treatment of non-small cell lung cancer depends on the cancer stage and the patient’s overall condition. Treatment options may include surgery, radiation therapy, chemotherapy, and any combination of these options. Radiation therapy may be used before surgery, frequently in combination with chemotherapy, to make a tumor smaller and easier to remove. Radiation can be given after surgery, with or without chemotherapy, to kill any cancer cells that may still be present after surgery. Radiation, frequently with concurrent chemotherapy, may be used to treat lung cancers that are too extensive to remove surgically. In some circumstances, radiation therapy can be used alone, without surgery or chemotherapy. The most common form of radiation therapy is external beam radiation therapy. With external beam radiation therapy, the patient lies on a table and a beam or multiple beams are emitted from a machine known as a linear accelerator. The beams are directed to the tumor and surrounding tissues that may also contain cancer cells. The beams penetrate the skin, other tissues, and organs before reaching the tumor target. 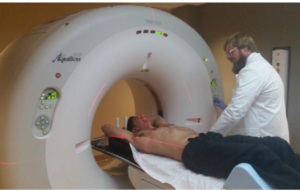 External beam radiation therapy is given daily during the week, Monday through Friday, typically for 6 to 7 weeks. Scheduling the radiation treatment this way allows for an effective dose of radiation during the week to kill the cancer cells, and allows the patient and normal cells to recover during the weekend from the effects of radiation. 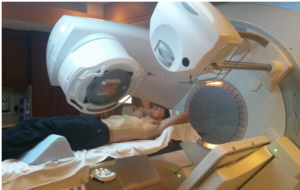 The treatment takes 5 to 10 minutes, depending on the type of linear accelerator used. The typical dose of radiation given for most lung cancers ranges from 6000 to 7000 cGy (centigray), depending on the stage and whether or not chemotherapy is included. Such a high dose of radiation cannot be given all at once to a patient without lethal side effects. Therefore, the dose given per treatment is 180 to 200 cGy, which usually is well tolerated by patients. The unit centigray replaces the older term “rad” as a measure of radiation dose; 100 centigray is equal to 1 gray (Gy), which is equal to 1 Joule per kilogram of tissue (1 Joule = 1 Newton-meter). The delivery of radiation therapy requires several individual team members that play a crucial role in the successful treatment of patients. Radiation oncologists are medical doctors who have completed medical school and at least 5 years of residency training before joining the work force. They are frequently certified by the American Board of Radiology (although they are not diagnostic radiologists). Radiation oncologists talk to, examine, and counsel patients for consultation, and design and direct the radiation treatment plan. Radiation oncologists are the physician specialists during a patient’s radiation therapy who provide evaluation, simulation (discussed next), weekly treatment visits, and follow-up visits after completing treatment. Radiation oncology nurses provide detailed education to patients on the clinical aspects of radiation treatment. They provide counseling on managing any side effects of treatment and tips on how to decrease the intensity of side effects. They often are the team members who address patient concerns and communicate more serious issues to the radiation oncologist. Medical physicists perform scheduled quality assurance tests to ensure that linear accelerators are working properly. They work closely with radiation oncologists and dosimetrists to help design the radiation treatment plan. They often supervise the dosimetrist in making sure the treatment plan is feasible and tailored to the individual patient. Radiation therapists operate the linear accelerators, place patients in the correct position, give the daily radiation treatments, and keep an accurate record of treatments given.1 Other staff members are important to patients receiving lung radiation, including social workers, physical therapists, occupational therapists, dieticians, and respiratory therapists. After the consultation with the radiation oncologist and a decision has been made for a lung cancer patient to receive radiation therapy, the patient first must undergo simulation. Simulation is a procedure where a radiation oncologist and a simulation technician (usually a radiation therapist) place the patient in the exact position for treatment to ensure that the radiation hits the correct target consistently. The patient lies down on the back, usually with the arms placed above the head. There may be immobilization devices such as handlebars for the patient to hold onto above the head. Custom cradles may be molded to conform to the patient for lying in the same position for each treatment. Skin marks (which may be washed off) and permanent tattoos (pinpoint dots, no larger than a mole) are placed and lined up with laser pointers in the room to make sure the patient can lie in the same position each day. In some institutions, X-rays are taken after the patient’s treatment position has been determined. Subsequently, a CT (computed tomography) scan of the neck and chest is done in the treatment position with all the immobilization devices in place (Figure 1). This CT scan will provide a computerized 3-dimensional digital virtual model of the patient’s chest and internal organs. The radiation oncologist and dosimetrist use this model to design a patient’s radiation treatment fields on a planning computer equipped with radiation treatment planning software. This planning or simulation CT scan is different from the diagnostic CT scan used to help diagnose and stage the lung cancer. Intravenous contrast is sometimes used at the discretion of the radiation oncologist designing the treatment fields, and this contrast can provide better detail about the extent of the lung cancer. Planning CT scans for simulation typically take less time to obtain than diagnostic scans. 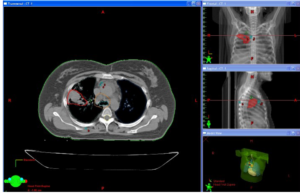 Furthermore, planning CT scans are not read or interpreted by a diagnostic radiologist, butare processed with treatment planning software to help design the treatment fields. 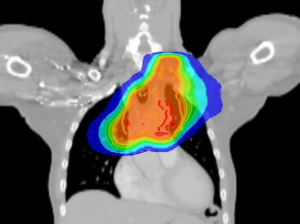 Some institutions use 4-dimensional CT, which is a planning CT scan that tracks how a patient’s breathing cycle affects the location of the lung tumor (a technique known as respiratory gating).2 The distance a tumor moves up, down, or sideways can be useful to the dosimetrist to determine the margin size around the tumor required for planning treatment. After simulation is completed, the radiation oncologist, dosimetrist, and medical physicist develop a treatment plan. The simulation CT scan images are electronically sent to a computer with treatment planning software. The slices of the CT scan are reviewed and the anatomic structures, such as the lungs, heart, and spinal cord, are outlined or contoured in different colors. The sum of the slices of these contours define the volume of the anatomic structures (Figure 2). The radiation oncologist, using information from positron emission tomography (PET) scans, diagnostic CT scans, and other reports, will contour the actual tumor and lymph nodes involved with cancer. The volume of the actual tumor is called the gross tumor volume, and the gross tumor volume frequently is contoured in red.3 At some centers, the dosimetrist can take a PET scan (previously obtained to stage the tumor) and fuse this with the simulation CT scan. 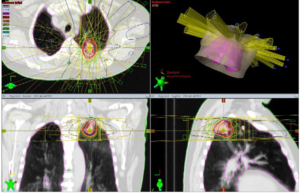 Because the lung tumor and regional lymph nodes light up brightly on the PET scan, fusion with the simulation CT scan can greatly help the radiation oncologist define the volume of the cancer with more accuracy. A typical method used to treat lung cancer involves two fields: one field is oriented facing the patient’s front chest (anteroposterior [AP]) and one field is oriented facing the patient’s back (posteroanterior [PA]). The term AP/PA is used to describe this setup (Figure 3). The initial AP/PA fields frequently include the spinal cord (Figure 4a). The spinal cord can usually tolerate 5000 cGy before the risk of spinal cord damage occurs. Radiation oncologists usually aim to keep the spinal dose below 4500 to 5000 cGy, but may use a lower dose when chemotherapy is used concurrently with radiation. Most lung cancer treatments involve doses of 6000 to 6600 cGy, so the patient cannot be treated using AP/PA fields for the entire treatment. Therefore, the patient is treated using AP/PA fields to a dose between 4000 to 5000 cGy, and then the fields must be modified. As you can see from Figure 4a, the radiation dose is shaped more like a rectangle and results in some normal lung getting the similar doses as the tumor volume. The modified fields are called the off cord boost. The typical method of designing an off cord boost is to change the angle of the fields to oblique fields that are diagonal and avoid the spinal cord (Figure 4b). Attempts are made to include the involved lymph nodes with the gross tumor volume and safely avoid the spinal cord. However, if this is not possible, the off cord boost may treat only the gross tumor volume. The inclusion of the involved lymph nodes in the off cord boost can sometimes be done with the use of intensity modulated radiation therapy. A technique known as intensity modulated radiation therapy (IMRT) uses multiple beams or fields directed at the gross tumor volume and involved lymph nodes. A 1.5 to 2.0 cm margin frequently is placed around the gross tumor volume to account for tumor motion (from breathing), setup variation, and patient motion. 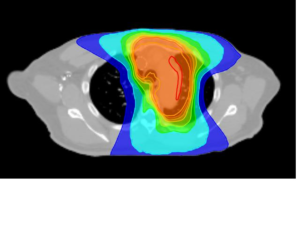 IMRT has been a popular method of treating lung cancers because the intensity of each beam directed at the tumor can be varied to where the sum of all the beams adds up to a dose cloud that better conforms to the shape of the tumor (Figure 5). Although IMRT allows a radiation oncologist to spare more normal lung and other normal tissues from the high dose meant for the tumor, it spreads low dose radiation to a larger area. Despite this, IMRT is instrumental in tracking dose to any organ and limiting the radiation dose to these areas. The technical aspects of IMRT are beyond the scope of this chapter, but a helpful website with information on IMRT can be found at http://www.radiologyinfo.org/en/info.cfm?pg=imrt. 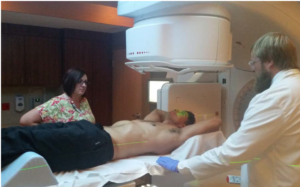 After the treatment plan is completed, the patient returns to the radiation therapy department for a block check or verification procedure (Figure 6). The patient is placed on the actual treatment machine (linear accelerator) in the same position as in the simulation CT scanner. Radiographs are made and reviewed to make sure that the images match the images on the planning CT scan and are consistent with the CT based treatment plan. Many treatment centers perform a low energy CT scan called a cone beam CT (CBCT) on the treatment table and overlay this CT with the planning CT scan to give a more precise confirmation of the accuracy of the field being treated and to enable any needed adjustments because of setup variations (see section on Quality Assurance). cancer patients, radiation is given every day from Monday to Friday, with weekends off, for approximately 7 weeks. The patient is on the treatment table receiving radiation for 5 to 10 minutes (Figure 7) and usually is in the department for < 1 hour. The time of the entire session includes arrival at the waiting room, changing into a gown, getting in the treatment position on the treatment table, and having the radiation therapist make any needed adjustments. The patient will meet with the radiation oncologist once a week on a specified day to review how the patient is feeling. During these weekly visits, the patient can ask any questions that may not have been addressed during the consultation. The radiation oncologist will check to see if there are any side effects from the radiation treatment and may prescribe medication to help with these side effects. Surgery, usually a lobectomy, is the typical treatment for Stage I and II non-small cell lung cancer. However, not all patients have surgery, either because of a personal preference to avoid surgery or because of medical conditions, such as severe emphysema or heart disease, that increase the potential risk of surgery and anesthesia. If surgery cannot be done for a stage I or II non-small cell lung cancer, radiation therapy is a good alternative. Stereotactic radiosurgery (SRS) is a technique in which a very high dose of radiation is given to a small area over a short period of time, either as a single treatment or 5 treatments over one week. The term SRS has always applied to patients being treated for brain tumors. Radiosurgery, contrary to what the term implies, is not surgery and does not involve any incision or cutting by the radiation oncologist, but the high dose of radiation results in the killing of the tumor as if it was surgically removed. The high precision of the multiple beams used in stereotactic radiosurgery results in the margins around the gross tumor volume being much smaller (0.5 cm to 1.0 cm) than with typical radiation therapy techniques (Figure 9). 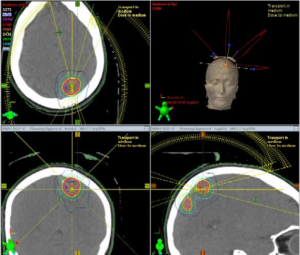 Gamma Knife, CyberKnife and linear accelerator based SRS (Tomotherapy, VMAT, and Rapid Arc), are examples of proprietary methods of delivering SRS. Gamma Knife is only used for SRS to brain lesions. Stereotactic radiosurgery for tumors other than the brain is known as stereotactic body radiation therapy (SBRT), stereotactic ablative radiotherapy (SABR), or extracranial radioablation (ECRA). This method is widely used for medically inoperable patients with stage I or II non-small cell lung cancer, with comparable or better outcomes when compared with typical radiation therapy techniques.6, 8Dose fractionation in stereotactic body radiation therapy includes either a total dose of 6000 cGy given in 3 treatments of 2000 cGy over a period of 2 weeks, or a total dose of 5000 cGy given in 5 treatments of 1000 cGy daily over 1 week. 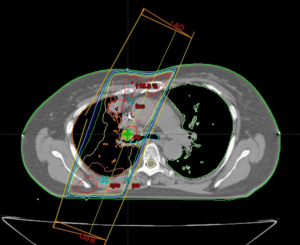 A patient may be treated with SBRT for non-small cell lung cancer if the tumor is ≤ 5 cm in greatest diameter and peripheral to the mediastinum (more to the side of the chest rather than the middle).9 CyberKnife and linear accelerator based SRS (Tomotherapy, VMAT, and Rapid Arc), are examples of proprietary methods of delivering SBRT. Gamma Knife is not used in SBRT. In stage IV non-small cell lung cancer, the cancer has spread to the opposite lung, metastasized to a different organ (such as the liver, brain, or bones), or produced fluid containing cancer cells within the space surrounding the lung (a condition known as a malignant pleural effusion). The primary treatment for patients with stage IV non-small cell lung cancer is chemotherapy. The various drugs used in stage IV non small cell lung cancer are discussed in more detail in the chapter on chemotherapy for non-small cell lung cancer. See Chapter 3: Systemic Therapy for Non-Small Cell Lung Cancer). If a patient has ≤ 3 brain metastases and all the lesions are ≤ 3 cm in diameter, the patient may have surgery to remove the metastases, followed by whole brain radiation to prevent new tumors from forming,15 or the patient could be treated with stereotactic radiosurgery (SRS). Stereotactic radiosurgery for brain metastases has the advantage of allowing for less brain radiation but the disadvantage that new brain metastases could form in areas that were not radiated. When lung cancer spreads to the vertebrae, patients may experience severe back pain. The growing cancer could compress the spinal cord and cause paralysis. These metastases can be removed surgically, especially if there is only one metastatic lesion. In this case, radiation therapy is given 2 weeks after surgery to prevent the cancer from recurring in the spine.16 If metastases are too extensive to remove surgically, radiation therapy alone is used, most commonly at a dose of 3000 cGy (10 treatments of 300 cGy fractions over 2 weeks). 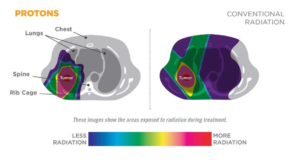 In cases where a previously treated vertebral body metastasis comes back, stereotactic body radiation therapy (SBRT) can be used to better avoid previously treated tissue and concentrate radiation to the areas involved by the cancer, using techniques similar to SRS of the brain. Proton beam therapy is a form of external beam radiation therapy that uses protons (usually from a hydrogen atom) instead of x-rays. Proton beams do not have any exit dose beyond the target tumor. Therefore, the radiation from proton beams is deposited only along the path of the beam to the tumor, and no radiation is given behind the tumor, so the patient receives less radiation to nearby normal tissue. Proton beam therapy is available only in slightly over 20 centers in the United States and is used in unique situations, such as in children with brain or spinal tumors where it is critical to protect as much normal tissue from radiation.1 In lung cancer, proton beam therapy is especially useful in patients who have been treated with conventional radiation therapy multiple times and need repeat treatment to the same area. With regards to the skin reaction over the skin of the chest corresponding to the treatment portals, the intensity of the reaction is typically increased when chemotherapy is given during the radiation treatment. The skin over the back (posterior chest) tends to be more affected than the front (anterior chest). Patients can get a sunburn-like reaction with a painful burning sensation that can progress to skin peeling (often called desquamation). Although the skin effects are well tolerated by most patients, a small number of patients can develop severe redness and skin peeling, and require daily wound care. Fortunately, such severe skin reactions are not frequent. The skin heals fairly quickly after completing radiation, and most redness and peeling resolve in 4 to 6 weeks. By the 3-month mark, there may a tan corresponding to the radiation treatment fields. Subacute side effects occur 1 to 6 months after completing radiation therapy. These side effects are less frequent and may include radiation pneumonitis, which is inflammation of the lung that causes chest pain, fever, and cough.18 As mentioned above in the section on treatment planning, radiation pneumonitis occurs infrequently, especially when the V20 (volume of both lungs receiving ≥ 20 Gy or 2000 cGy) is no more than 35%. Your radiation oncologist, dosimetrist, and physicist work hard to ensure that the least amount of radiation possible goes to normal lung without sacrificing coverage of the lung tumor. Treatment of radiation pneumonitis includes corticosteroids such as prednisone or dexamethasone. Another rare subacute side effect is pericardial effusion or tamponade, in which fluid accumulates in the pericardium (the sac surrounding the heart), causing pressure on the heart, neck vein distention, shortness of breath, and a rapid heart rate. Pericardial effusions may resolve spontaneously, but in some cases, treatment may include needle aspiration to drain the excess fluid, or diuretics. Long term side effects of lung radiation therapy include pulmonary fibrosis (permanent scarring of the radiated lung tissue), esophageal fibrosis and stricture (scarring and narrowing of the esophagus that causes difficulty swallowing and treated with esophageal dilation), constrictive pericarditis (shrinkage of the sac surrounding the heart, that may require surgical removal), and damage to the heart muscle and blood vessels that may increase the risk of heart failure and heart attack. These long term side effects are uncommon because modern radiation therapy techniques have resulted in better sparing of normal tissues and organs. American Society for Radiation Oncology. Radiation Therapy for Cancer. Fairfax, VA: American Society for Radiation Oncology, 2009. Zhang J, Xu GX, Shi C, et al. Development of a geometry-based respiratory motion-simulating patient model for radiation treatment dosimetry. J Appl Clin Med Phys. 2008:9(1):2700. Kong FM, Ritter T, Quint DJ, et al. Consideration of Dose Limits for Organs at Risk of Thoracic Radiotherapy: Atlas for Lung, Proximal Bronchial Tree, Esophagus, Spinal Cord, Ribs, and Brachial Plexus. Int J Radiat Oncol Biol Phys. 2010 Oct 7. [Epub ahead of print]. Graham MV, Purdy JA, Emami B, et al. Clinical dose-volume histogram analysis for pneumonitis after 3D treatment for non-small cell lung cancer (NSCLC). Int J Radiat Oncol Biol Phys. 1999;45(2):323-9. Nabavizadeh N, Elliott DA, Chen Y, et al. Image Guided Radiation Therapy (IGRT) Practice Patterns and IGRT’s Impact on Workflow and Treatment Planning: Results From a National Survey of American Society for Radiation Oncology Members. Int J Radiat Oncol Biol Phys. 2016 Mar 15;94(4):850-7. Chang JY, Bradley JD, Govindan R, et al. Inoperable Non-Small Cell Lung Cancer -Definitive Radiotherapy for Stage I/II. In: Halperin EC, Perez CA, Brady LW, eds. Principles and Practice of Radiation Oncology. Philadelphia, PA: Lippincott Williams & Wilkins; 2008:1086-7. Slotman BJ, Antonisse IE, Njo KH. Limited field irradiation in early stage (T1-2N0) non-small cell lung cancer. Radiother Oncol. 1996;41:41-4. Timmerman RD, Paulus R, Galvin J, et al. Stereotactic Body Radiation Therapy for Medically Inoperable Early-stage Lung Cancer Patients: Analysis of RTOG 0236. Int J Radiat Oncol Biol Phys. 2009; 75(3S):S3. Timmerman R, McGarry R, Yiannoutsos C, et al. Excessive toxicity when treating central tumors in a phase II study of stereotactic body radiation therapy for medically inoperable early-stage lung cancer. J Clin Oncol. 2006;24(30):4833-9. Jabbari S, Hansen EK, Haas-Kogan DA. Non-small Cell Lung Cancer. In: Handbook of Evidence-Based Radiation Oncology, 2nd Ed. New York, NY: Springer; 2010:221-247. Douillard JY, Rosell R, De Lena M, et al. Impact of postoperative radiation therapy on survival in patients with complete resection and stage I, II, or IIIA non-small-cell lung cancer treated with adjuvant chemotherapy: the adjuvant Navelbine International Trialist Association (ANITA) Randomized Trial. Int J Radiat Oncol Biol Phys. 2008;72(3):695-701. Hayman JA, Abrahamse PH, Lakhani I, et al. 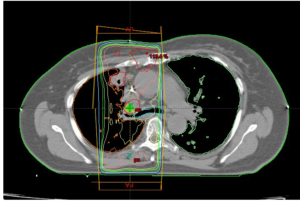 Use of palliative radiotherapy among patients with metastatic non-small-cell lung cancer. Int J Radiat Oncol Biol Phys. 2007;69(4):1001-7. Tsuji SY, Wara WM. Palliation and Benign Conditions. In: Handbook of Evidence-Based Radiation Oncology. New York, NY: Springer; 1994:675-690. Brown PD, Pugh S, Laack NN, et al. Memantine for the prevention of cognitive dysfunction in patients receiving whole-brain radiotherapy: a randomized, double-blind, placebo-controlled trial. Neuro Oncol. 2013 Oct;15(10):1429-37. Patchell RA, Tibbs PA, Regine WF, et al. Postoperative radiotherapy in the treatment of single metastases to the brain: a randomized trial. JAMA. 1998;280(17):1485-9. Patchell RA, Tibbs PA, Regine WF, et al. Direct decompressive surgical resection in the treatment of spinal cord compression caused by metastatic cancer: a randomised trial. Lancet. 2005;366(9486):643-8. Nag S, Scruggs GR. Clinical Aspects and Applications of High-Dose-Rate Brachytherapy. In: Halperin EC, Perez CA, Brady LW, eds. Principles and Practice of Radiation Oncology. Philadelphia, PA: Lippincott Williams & Wilkins; 2008:560-582. Chang JY, Bradley JD, Govindan R, Komaki R. Toxicity of Normal Tissue. In: Halperin EC, Perez CA, Brady LW, eds. Principles and Practice of Radiation Oncology. Philadelphia, PA: Lippincott Williams & Wilkins; 2008:1102-4.